So how about some nuts and bolts? My mother-in-law made a big batch of these at Christmas and every time she put a bowl out, we'd dip in and keep coming back until, in very short order, the bowl was completely empty. I don't think I should even contemplate how many I ate on our day trip down to Seattle . . . but let me tell you, they are a perfect car snack. They're not messy, but they're super tasty and you've got at least two food groups with all the cereals and peanuts. My mother-in-law made them gluten-free and my husband was so pleased that I knew I'd have to repeat them again soon at home. They're a cinch. Basically, just mix a bunch of cereal with some oil and spices and bake. I couldn't resist sampling a few before they went in the oven and they were darn good, but what happened in the oven was magical. 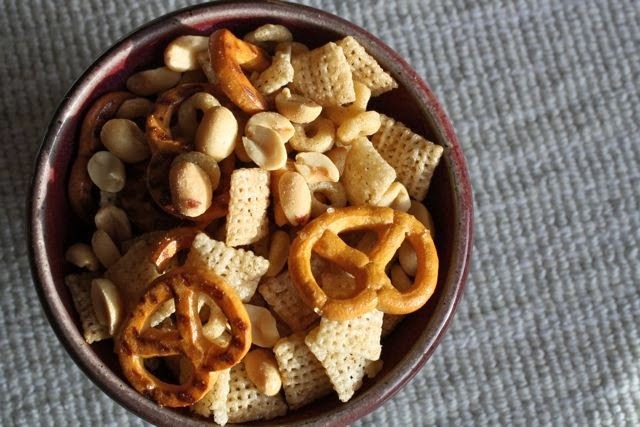 The bolts slowly crisped and transformed themselves from separate cereals into one golden, cohesive snack mix. I know you might be skipping down to the recipe now and might be astonished by the amount of oil called for . . . This is a retro snack. I actually cut the oil from two cups to one and a half and it still tasted great. And this recipe makes a tonne of nuts and bolts (think: two of your biggest Tupperware containers overflowing). So I don't think there's very much oil per serving. And the oil is, I truly believe, essential to create that lovely, golden, crisp finish. Just try it. All the cool retro kids are doing it. * That would be very, very positive. Preheat the oven to 250 degrees Fahrenheit. Pour the cereals onto an industrial-size cookie sheet, or even two if you don't like nuts and bolts escaping onto the counter as you carefully mix them. Whisk the oil with the Worcestershire sauce, celery salt and garlic powder. Alternately pour and mix them with the cereal until it's all mixed in. Don't worry if some spices are hanging out at the bottom of the bowl. Just scrape them out and put them on the cereal. This is a very forgiving recipe. Stir every 15 minutes or so and bake for a total of two hours. When cool, toss with peanuts and eat. *I used three-quarters of a 365 g. box because I love Chex. But the original recipe called for half a box. 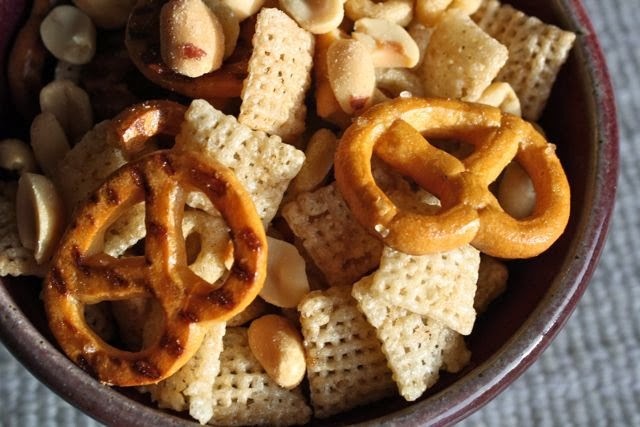 I looooove snack mix like this. My mom used to make it for us too and I'll do the recipe on the side of the shreddies box from time to time. Going to try this version! How fun! I didn't grow up with these kinds of snack mixes, so they've been fun to discover in my husband's family. I hope you like this version! 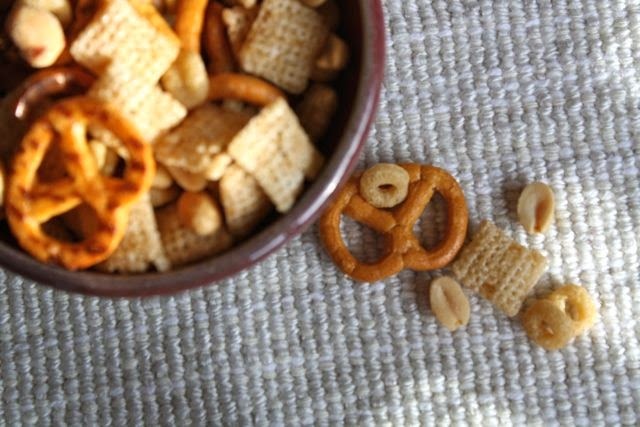 Watch out for the Chex -- it's super addictive! These were a holiday staple growing up!